Dental disease in dogs and cats is the most common chronic inflammatory condition seen in practice. It is seen more commonly in smaller dog breeds and is more common as they get older. What exactly is dental disease? Dental disease or peridontal disease is a build up of plaque and tartar on the teeth. Plaque is a layer of micro-organisms such as bacteria that covers the surface of the teeth. If left, over time this layer becomes mineralised to become calculus or tartar. More plaque will then build up on-top of the tartar. In turn this new plaque will mineralise and thicken the layer of tartar. The bacteria in the plaque causes inflammation of the gums known as gingivitis. The bacteria can also be absorbed into the bloodstream and become deposited in other organs in the body, such as the heart or kidneys. The growing tartar will lead to gum recession over time. If left untreated the gingivitis, plaque and tartar lead to irreversible destruction of the tissues supporting the teeth and can lead to loss of tooth function and tooth loss. The best way to prevent dental disease in dogs or cats is by brushing their teeth. This should be done on a daily basis, because plaque starts to mineralise within 24 hours. It is the mechanical action of the brushing that does the most of the work to remove the plaque from the teeth. Brushing does not do much to remove tartar which is why it is important to start brushing early. A soft bristled toothbrush should be used and tooth brushing should start as soon as the deciduous teeth are present. Toothpaste can be used but it should be made for pets and not have any fluoride. The pet toothpaste is often a tasty flavour to help with acceptance and may have enzymes to give supplemental action. Do not use human toothpaste. How do I brush my pets teeth? Your pet will need to be trained to allow teeth brushing in a step by step process. First of all get them used to just being stroked around their mouth. If they are good and happy with this give them lots of praise and some healthy treats. Once they are happy with this on several occasions then move on to the next step. Get them used to having their upper lip lifted and their gums toucged. The next step is to touch the teeth and wipe your fingers across them. Again do not move on to the next step without being sure your pet was happy on a few occasions with the previous step. Next you would start to introduce the toothpaste. First just place a small bit on your fingers and let them lick it off. Then place a small amount on the toothpaste and let them lick it off again. 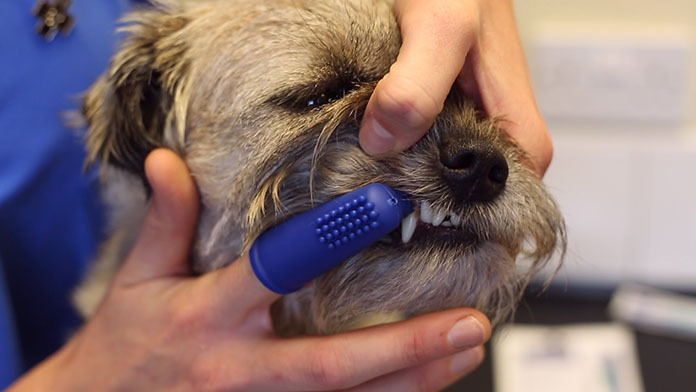 Once they are happy to do this you can gently lift your pets lip and place the brush against the upper canine tooth and gently brush in a circular motion. Each few days gradually increase the numbers of teeth that are brushed. If at any point your pet gets upset, stop and try again another time, going back to the previous step if needed. Overtime build up to brushing each side for 30-60 seconds each. Brushing should be done with the mouth closed whilst just lifting the lips. The toothbrush should be placed at a 45 degree angle to the tooth. Remember to give lots of praise and some healthy treats after each session. Is tooth brushing the only option? Brushing your pets teeth has been shown to be the best way to maintain healthy teeth, much as the same for humans. There are some other things that can be used to supplement this but they are not a replacement. In some animals it may be the only option but with training most dogs and cats can learn to accept tooth brushing. Special dry food diets have been made which are designed to help keep the teeth clean such as Hills T/D or Royal Canin Dental. These biscuits are designed to help with mechanical teeth cleaning and may also have other ingredients to help reduce tartar and plaque formation. Special dental chews are available which can be given daily to help keep the teeth clean by mechanical actions. These have been shown to help but some of them are high in calories and so should be allowed for in the diet. There are also products such as Plaque Off which are designed to reduce the formation of plaque. If your pet has dental disease they will require a dental procedure under anaesthesia. During this we may take xrays to check the condition of the tooth roots. Any diseased teeth will be removed and the rest of the teeth will be cleaned of tartar and plaque and polished. This will then need to be followed by regular at home dental care with tooth brushing to maintain healthy teeth and gums. If you are concerned you pet may have dental disease then call the practice on 01702 545558 to make an appointment to see one of our vets.